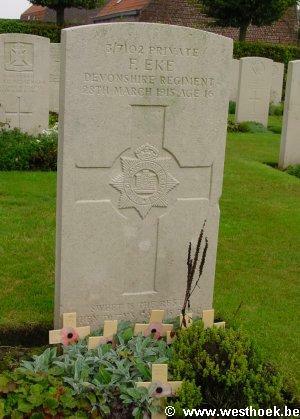 Private F EKE 317102 1st Bn., Devonshire Regiment who died on Sunday 28 March 1915. Age 16. 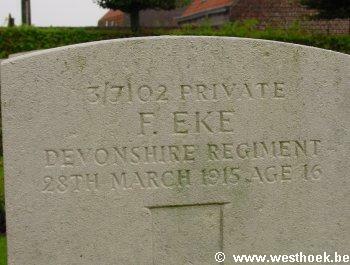 Private F EKE 317102 1st Bn., Devonshire Regiment who died on Sunday 28 March 1915. Age 16. Son of William and Elizabeth A. Eke, of 29, Morley Place, Plymouth. Native of Plymouth. LOKER CHURCHYARD Grave : II. B. 10.